Japan a country that both relies on tradition yet embraces new technology, no more so than in the arcade industry. 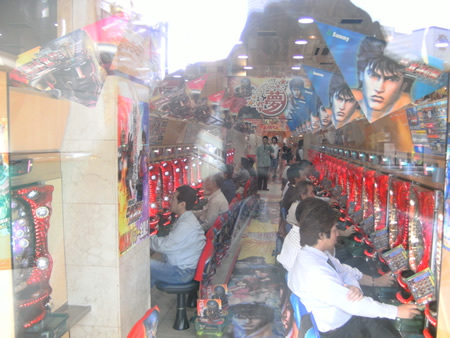 Whilst around the world, arcades are struggling, Japanese arcades have bucked the trend, still remaining popular. Japan has been successful as retaining the arcade culture by basing their games around popular franchises. Beat-em-ups, shoot-em-ups and simulation games are still all popular, so what games are – in 2009 – big in Japan? To find out, I took a trip to Akibahara, Tokyo. The geek capital of the world, to have a look. Unfortunately, some games were in Japanese, so I have no idea of the name. Any help will be greatfully received! Also, some of the pictures are quite low quality, I apologise for this. This wasn’t seen in Akibahara, but in Nagasaki’s “Taito Station”. The game plays similar to Point Blank, with missions to complete, rather than a traditional rail shooter. However, instead of shooting, the screen is pressure sensitive to balls, which are thrown to hit targets. This game gets tough very, very quickly, with a large majority of multiple targets to throw balls at. Unless you’ve got a friend, or six arms, you’ll probably not going to complete this game. Yes, I’ve been reliably informed you can play it in the UK, but I haven’t seen it over here. 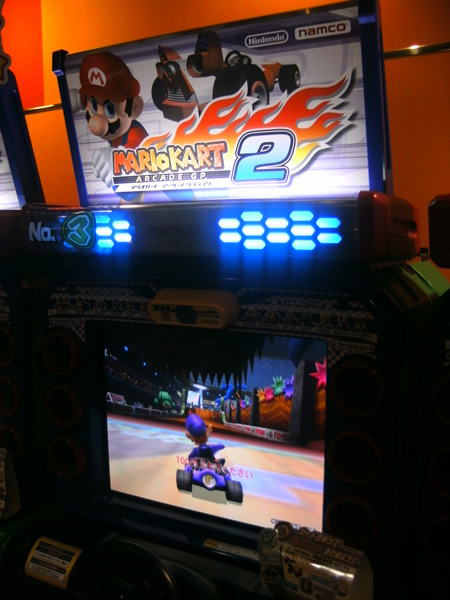 The game is based on the classic Mario Kart game, and it’s a completely new game featuring all your favourite characters. The courses are familiar but different (I think a lot of them were based on Mario Kart: Double Dash), and you get the added bonus of 4 new characters, a Tamagotchi, Pac Man, Mrs Pac Man & Binky. 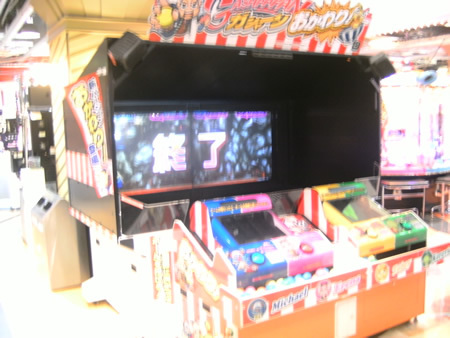 Gambling is technically illegal, but you wouldn’t think it looking at looking at the huge Pachinko halls, and they are also in every arcade as well. Pachinko consists of firing balls into a machine, and trying to land in a centre gate, which starts a slot machine mechanism. If you win, you win balls. Balls can then be exchanged for prizes, which conveniently can be bought back by the parlours for cash. They’re quite a sight, a wall of light and noise (and also smoke) greet you on entry. I didn’t play it (a high barrier of 250 balls for 1000 Yen put me off, but it was fun looking around. 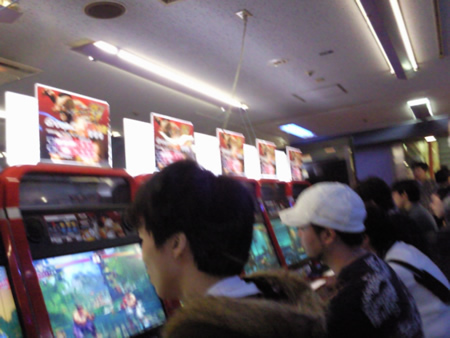 The main game out there was still the beat em ups, and floors of arcades are dedicated to them. Sitting on top of the roost was Street Fighter 4, the lastest incarnation of the classic beat em up franchise. Try playing against the computer, and you’ll struggle, instead put your 100 Yen to challenge one of the residents, though you’ll probably get beaten, and not sure who it is. Yes arcade machines are back to back, so you don’t ever see your opponent. Must be some sort of social difficulties for why this is the case. Wierdly, one of the most popular games there wasn’t based from Japan, but rather from over the Pacific at Valve software. 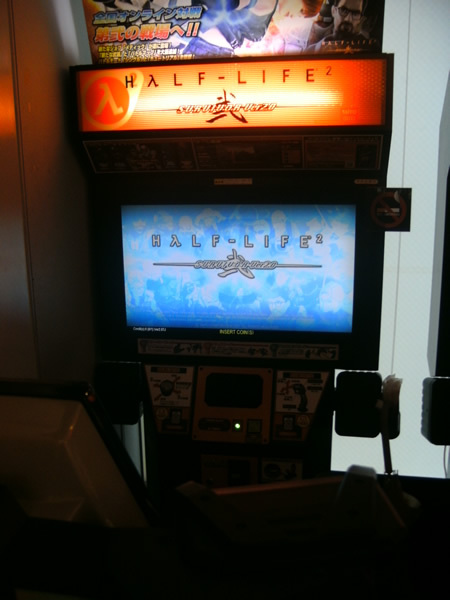 Yes, one of the rarest things I saw there (but one of the best) was a sit down cabinet of Valve’s Half Life. Wierdly, you could play the whole game all the way through (if you’re rich and good enough, the game is split into 100 Yen Chapters), but more fun – like always – are the deathmatches. There is a link up mode where you can link upto any arcade in the world and play a 4 v 4 deathmatch (the other 3 machines at your location will be your teammates), that plays fantastically. Controls are with two joysticks, and it’s a lot of fun. Another big thing are card games, which I couldn’t understand. World Club Champion Football was the easiest to understand. Basically, on sale in Japan are Top Trumps esque cards, which become your team. Unlike top trumps, you put these cards on a mat, and you use these cards to play the game, moving them around, issuing orders to your players, and hopefully picking up a win. I didn’t understand most of the other card games, but this one seemed simple, and possibly could work in the UK. Come on Sega, sort it! Good to know that arcades are still alive somewhere!